Q Can you tell me the deminsions of the backplate? 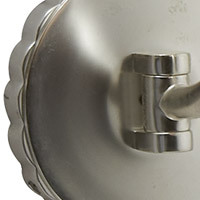 A The back plate on the Visual Comfort Barbara Barry Aspect 1 Light Decorative Wall Light BBL2027PN-L measures 4.75" H x 2.5" W.
Q Can it be installed in the bathroom? We need IP44 to install it near mirror over sink. A The Visual Comfort Barbara Barry Aspect 1 Light Decorative Wall Light BBL2027PN-L is not rated for a damp or wet location. It is recommended only for dry locations due to the shade. 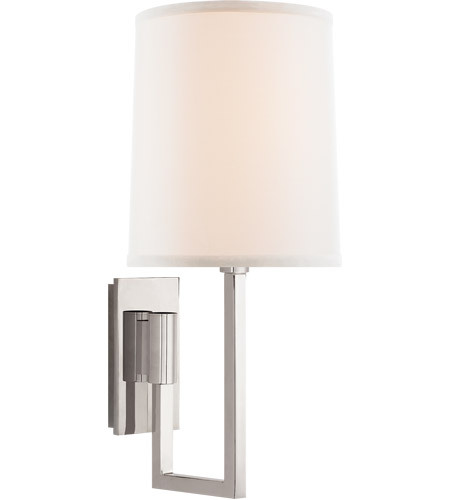 A The Visual Comfort Barbara Barry Aspect 1 Light Decorative Wall Light BBL2027PN-L has a fixed arm that does not swivel. Q Can I turn this light on and off manually? 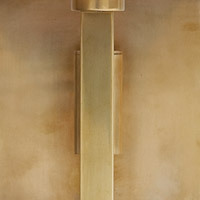 A The Visual Comfort Barbara Barry Aspect 1 Light Decorative Wall Light BBL2027PN-L does not have its own On/Off switch. 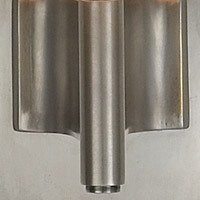 This fixture is controlled using a standard wall switch.